Sepsis can and does affect people of all ages. The very young and those who already have a chronic health problem or a compromised immune system are at higher risk of developing sepsis. But people over 65 years old, particularly those who have health issues, are even more susceptible to sepsis than any other group. According to a study published in 2006, while people aged 65 years and older make up about 12% of the American population, they make up 65% of sepsis cases in the hospitals. Sometimes incorrectly called blood poisoning, sepsis is the body’s often deadly response to infection or injury. Sepsis kills and disables millions and requires early suspicion and rapid treatment for survival. How does sepsis occur in older people? Researchers believe that as we age, our immune system becomes less effective at fighting infections. This results in older people contracting more infections and they are more severe. Every infection we get means we have a risk of developing sepsis. As well, as people age, they may develop chronic illnesses, such as diabetes, kidney disease, or heart failure. It’s not unusual to see someone with two or more chronic diseases. Any type of infection can cause sepsis, from the flu to an infected bug bite, but the most common infections that trigger sepsis among older people are respiratory, such as pneumonia, or genitourinary, such as a urinary tract infection (UTI). Infections can also happen through infected teeth or skin sores, either from a simple skin tear because the skin may be dry or fragile, or a pressure sore from sitting in a wheelchair or lying in bed. There are many ways an infection can take hold. It’s not always easy to spot infections among older people. For example, symptoms of a UTI usually include the need to urinate frequently, a sense of urgency (you need to urinate immediately), not feeling as if you’ve emptied your bladder completely, burning or pain while urinating, and cloudy and foul smelling urine. For many seniors though, the first sign of a UTI is a change in their mental status – they become confused or disoriented. So the infection could be present for quite a while before it is noticed. The same could happen with other infections, like pneumonia. Since infections might not be obvious, if an older person becomes confused or behaves in an unusual manner, or if confusion or disorientation worsens, this could be a sign of an infection. Sepsis can move into severe sepsis quickly, so getting help and treatment as quickly as possible is vital. Why is sepsis so serious for older people? Sepsis is a very serious illness for anyone at any age, but it can be particularly devastating for seniors. 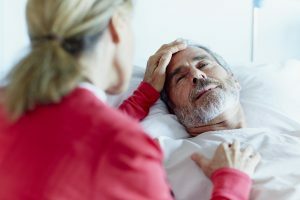 According to a study published in 2010, older severe sepsis survivors were more than three times more likely to see a drop in cognitive (mental) abilities that can make it impossible for them to return to their previous living arrangements. This often results in admission into a chronic healthcare facility. As well, the risk of dying from severe sepsis or septic shock rises as you get older. Sepsis doesn’t affect just the patient, researchers have discovered. The stress of having a family member who is so ill can take a toll on spouses or partners too, especially if they are the primary caregivers. For example, a study published in 2012 found that the wives of older sepsis survivors were at greater risk of developing depression, as much as three to four times the average. Depression can be very serious, affecting quality of life and even the ability to function independently. Sepsis needs to be suspected and recognized as quickly as possible. It must be treated fast as every hour that sepsis is not treated increases the risk of death. Treatment is with IV fluids and antibiotics. 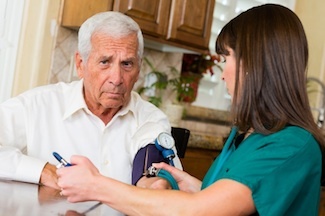 Other medications, such as those to raise blood pressure may be needed. If someone you know is admitted to an intensive care unit (ICU), you may see many machines used to monitor various things, such as body function (heart rate, blood pressure), medications and IV fluids that are being administered, and perhaps a ventilator to help the patient breathe. The key to preventing sepsis is to prevent an infection from occurring in the first place. If an infection does set in, it must be treated as quickly and effectively as possible. Many illnesses can be and are prevented through regular vaccinations, such as for the flu or pneumonia. The risk of getting an infection also drops with proper hand washing. Thorough, proper, and frequent hand washing with either soap and water or soapless products decrease the number of pathogens that could enter your body. Infections can also be reduced by proper care of all wounds, even the smallest scrape or cut. A thorough cleaning with soap and water will help remove any bacteria at the wound opening. Any infection should be taken seriously. Do not hope it will go away. Action must be taken.